Roberto Dutesco is a New York–based Canadian photographer, poet and filmmaker. 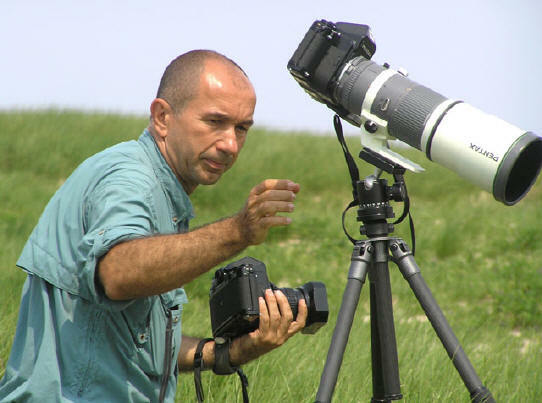 His award-winning work documenting the Wild Horses of Sable Island commenced in 1994. His films and photographs have brought international awareness and helped establish official protection for the island and its inhabitants. His SoHo gallery (est. 2006), presenting this documentation of Sable Island and it’s band of Wild Horses, was chosen as one of fifty must-visit places in New York City by Art Architecture Design Guide, teNeues, 2010. In 1994, Dutesco made a promise to the superintendent of Sable Island that one day the photos would be in a museum. In 2014, that promise was fulfilled and the Wild Horses of Sable Island were featured at the Natural History Museum in Halifax, Nova Scotia. Currently, the Wild Horses of Sable Island is on exhibit at the Museum at Prairiefire through a unique collaboration with the American Museum of Natural History. In 2017 launches IAMWILD, a global platform for transforming business and conservation. Dutesco has photographed prominent personalities of our times, such as Pierre Trudeau, the Dalai Lama and Mikhail Gorbachev. Completed photo series include The Wild Horses of Sable Island, The American Sandscape, Rocks & Things, Flowers & Dreams, Brîncusi: The Endless Column, The Human Landscape, Waters and East/West Travels of the 14th Dalai Lama. His published writings and poems include Ethereal Reflections, Alphabetical Mayhem and The Wild Horses of Sable Island. 1961 June 6. Born Bucharest, Romania. 1980 Moves from Romania to Canada. 1987–92 Becomes sought-after fashion photographer filling the pages of Elle, Vogue, Rolling Stone, Flare and many more. 1994 Sable Island odyssey begins. The start of a lifelong project. 2006 The Wild Horses of Sable Island opens to a crowd of over three thousand people in Soho, New York. 2007 Dutesco, Tunney and Arcadia crew arrive on Sable Island and begin principle photography for a feature documentary entitled Chasing Wild Horses. After three successive trips to the Island Dutesco and the crew complete filming. 2012 June. Publication of limited-edition book, The Wild Horses of Sable Island. 2014 June. Publication of The Wild Horses of Sable Island by teNeues. 2015 March. Publication of Roberto Dutesco reflects on Sable Island in the Canadian Geographic magazine. 2004 Here is Now and Water World, Montreal. An outdoor public art exhibit. 2007 Surfing Sable Island, New York. A collaboration with Scott MacDonough. 2007 Flowers and Poems, Lord and Taylor, New York. Fifth Avenue window installations. 2009 Ethereal Reflections, Lord & Taylor, Fifth Avenue, New York. A book of the same title is also published. 2010 We are Beauty, Amsterdam. A collaboration with Ivan Tse. 2011 Wild Horses of Sable Island, The Embassy of Canada’s Gallery, Washington, D.C.
2015 The Wild Horses of Sable Island, Museum at Prairiefire, Overland Park, Kansas. The Museum at Prairiefire is a unique collaboration with the American Museum of Natural History, New York. 2016 2nd print edition of The Wild Horses of Sable Island by teNeuese. 2016 Art Bussan Korea – Universality in collaboration with Dayspring Art Group. Award-winning director Cristian Mungiu's GRADUATION ("Bacalaureat"). 2017 4th- print edition of The Wild Horses of Sable Island by teNeuese. 2018 The Wild Horses of Sable Island Gallery (WHSI)-and DutescoArt presents Mr.